This post is part of a series on the rise of healthcare accelerators, and fostering collaborative medicine through innovation. Such is the current business environment of our healthcare industry. However, the tension between growing expenditures and narrowing profitability tells only a broad story. 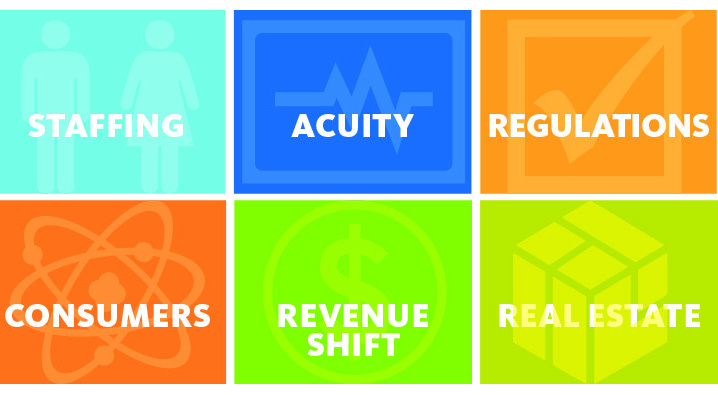 A deeper dive into the industry reveals a range of drivers that are transforming the business of healthcare. Here, we examine the six key drivers that we’ve identified and discuss spatial responses that not only bolster bottom lines, but also provide better patient experiences. Assuming that the shortage predications are reasonably accurate, the unprecedented demand for healthcare will speed the shift from a private doctor’s office model to a central, team-based model of care. As a result, efficiency in facilities planning will be vital. With the expectation that provider teams will see more patients in less time—without sacrificing the quality of time—efficient layouts are critical. To make these facilities more efficient, the proximity between the care team zones and patient spaces needs to increase, along with the real estate of exam room ratios per provider. Current best practices call for 2.5 exam rooms per provider. Projections show that the ratio will need to grow to as high as 5 exam rooms per provider. There is a growing sense that patient acuity—a measure of the intensity of nursing care required—is on the rise while inpatient bed counts are falling. The increase in acuity points to patients living decades longer despite contending with a range of moderate to severe health conditions. Yet in facilities geared toward geriatric care, design can help mitigate the effects of aging. For example, some materials and colors can create contrast between planes, thereby countering the effects of weakened vision. While medical-surgical bed counts are declining, the need for mental health beds is growing. Design for acute mental and behavioral health conditions must balance patient privacy with patient safety. Yet safety and durability are by no means the only driving factors in the design of mental-health spaces. Comfort is also key; the institutional and detention-like aesthetics of yesteryear have been shunned in favor of a more approachable and soothing design sensibility. Thanks to a new emphasis on improved care and transparency, reimbursements have become intricately tied to both quantitative and qualitative data. With rating systems making headlines and revenues dependent upon quality measures, the healthcare environment will need to step up to support better care through efficiencies, flow and aesthetics. Retail and hospitality industries have long harnessed the power of a well-crafted guest experience. The healthcare industry is just beginning taking a similar approach. Experience mapping is a part of this new emphasis. To be successful, it must consider physical movement in parallel with the emotional journey. This is the first important step in creating the ultimate user experience. Healthcare facilities can be complicated spaces. With additions piling up over the years and growth spreading to other buildings, many healthcare facilities are a maze of corridors—some spanning the length of several football fields. Technology can help patients navigate these complicated spaces and reduce the number of missed appointments by providing intuitive apps that guide visitors and put patients at ease. As healthcare spreads beyond the hospital, gray areas in regulatory and safety protocols arise before codes can catch up, sparking controversy and causing regulating bodies to go on alert. Witness the rise of ambulatory service centers, which today perform more than 23 million outpatient surgeries annually. One-stop shopping in care is a prime driver of the monumental growth in ambulatory centers. From building core shape and elevator cab sizing to column spacing and deck-to-deck heights, ambulatory centers must be highly tailored environments; the basic office building will not suffice. Given lingering regulatory questions, healthcare institutions must take into account ongoing changes in code. Healthcare providers must design with an eye toward the flexibility needed to adjust to new codes and to accommodate new treatment options. Patients are now conscious consumers looking for service over status. Hence the rise of the new symbol of patient consumerism: the urgent care center in the corner store. It is a model in which convenience and access supersede reputation and cost—and it has translated to roughly 3,000 retail-based clinics nationwide. The growth of retail clinics serves as further proof that consumers want more options and more convenient opportunities for care. However, convenience isn’t the only factor in determining where to seek care. In an increasingly competitive and consumer-oriented healthcare industry, aesthetics will only grow in importance as consumers demand environments where the quality of experience parallels the quality of care. Systems merge and grow by acquisition, with health campuses assimilating multiple provider groups, public entities and private organizations into a mission of health and wellness. Thus, the connection of a campus with green space and clearly prioritized circulation—for pedestrians, cyclists and public transportation riders—are keys for success. With constantly evolving technologies and treatments, campus buildings must also be flexible. Modular construction, whether it’s employed selectively within a facility or used to construct an entire building, can yield tremendous savings and allow healthcare facilities to adjust while eliminating downtime. Just within the last decade the healthcare sector has seen a marked shift in construction techniques, with 49 percent of the industry now using a modular approach. The drivers that we’ve identified will invariably shape the business of health—and the places where care is provided—for some time to come. However, our healthcare model is shifting, in a slow but perceptible way. It’s moving away from episodic care and toward sustained wellness; instead of focusing on treatment, the emphasis is shifting toward prediction and prevention. When wellness is the measure, people expect it to be addressed in a variety of ways and settings. Therefore, designing for wellness will require a broad scope of knowledge, one that includes an understanding of workplaces, hospitality venues, retail settings and urban streetscapes—every place where wellness happens. What this development means for the doctors’ offices, hospitals and retail clinics of today is a subject of much conjecture. But a system designed to prevent disease—and by extension prevent the accompanying physical, mental and financial strains—gets to the core goal of healthcare: enabling well-being. Bonny Slater's experience covers a range of healthcare projects, including the design of academic medical centers, community clinics, and foreign hospitals. Contact her at Bonny_Slater@gensler.com.